Accounting for both physical and digital sales, Sony has announced that Killzone: Shadow Fall on the PS4 has managed to shift over two million in sales worldwide. In a press release sent today, Sony has announced that combining both digital and physical sales, Guerilla Games' debut shooter on the PlayStation 4 -- Killzone: Shadow Fall -- has managed to sell over 2.1 million units worldwide. "I am thrilled that so many users have been enjoying Killzone: Shadow Fall since the launch of PS4," states Sony Computer Entertainment Worldwide Studios boss Shuhei Yoshida, and adds, "This title fully embraces the creativity of the development team at Guerrilla Games based in the Netherlands, and is a great representation of what SCE WWS has to offer. SCE will continue to deliver exciting software titles, and is currently developing more than 30 titles including Driveclub, inFAMOUS: Second Son and The Order: 1886 which offer entertainment experiences only possible on PS4." Killzone: Shadow Fall introduces players to a new chapter of the Killzone saga on the ISA's stronghold, Planet Vekta. Gamers play as Lucas Kellan, an elite soldier/intelligence officer of the Vektan Government who faces various challenges to stop the terrorist group Black Hand from destroying the planet. 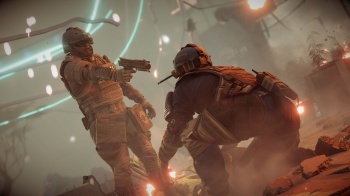 The shooter will add a clan system next month, with Guerilla Games also releasing two free multiplayer maps for users in the near future. Congrats, Guerilla! For those who've played the shooter, how is it holding up? Can it finally be Sony's answer Halo?